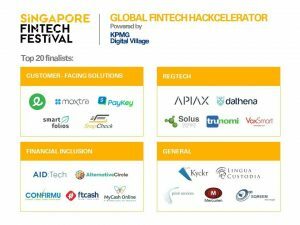 The Monetary Authority of Singapore (MAS) announced the finalists for the 2017 Global FinTech Hackcelerator this week. The Global FinTech Hackcelerator are among the highlights of this year’s Singapore FinTech Festival, which will take place in Singapore from 13 to 17 November 2017. In May 2017, MAS published a catalogue of 100 problem statements gathered from the financial industry and invited the global FinTech community to develop new and innovative solutions to any of the problems for the Global FinTech Hackcelerator. MAS received 580 submissions from over 40 countries. From the submissions, 20 teams were shortlisted by a panel of industry judges. The entries were evaluated on (i) Relevance, (ii) Competitive Advantage, (iii) Revenue, (iv) Scalability, (v) Business Stage, and (vi) Team Experience. Lingua Custodia is among the finalists going forward for the Global FinTech Hackcelerator awards. The Lingua Custodia team will follow a 12-week programme, led by KPMG Digital Village, during which they will work and meet with corporates, investors, partners and regulators. The teams will present a working prototype of their solutions followed by a Q&A session with the judges. The Demo Day judging panel, which represents a cross-section of the financial industry, will evaluate teams on their relevance to address the problem statement, company’s business potential, innovativeness of idea, and team profile and ability to execute.